Runners Yoga – For runners bodies AND schedules! *Our new website coming soon! IN THE 'ZONE', and INJURY FREE? all from One 30-Minute Routine you can do almost anywhere? WARNING: This is NOT another follow-along yoga video! 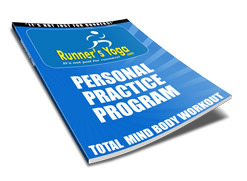 It is a comprehensive Instructional & 30-Minute-Home-Practice Program. WHAT YOU GET *Visual depiction of digital material. First, as great as you'll feel when you practice yoga (Provided you're taught properly! ), most people stop practicing for one simple reason - they just don't have enough time in their busy schedule. Improve your BALANCE, GAIT and POSTURE. Improve your MENTAL FOCUS and literally melt away STRESS. ... you probably won't do it. So what's the solution? That's what I wondered. And it's a quest that took me around the world. From Martial Arts studios in Japan, to Masters of ancient techniques in India. From the front-line trenches of the Western medical system, to studies with some of the world’s finest yoga instructors. Will easily fit into your busiest schedule. Literally melts away stress and calms your mind. A program so effective, so 'user-friendly' you can, and according to research, probably will make it a regular part of your fitness program. The Runner’s Yoga Program is not another follow-along yoga video. A comprehensive set of audio-visual modules that take you step-by-step, literally second-by-second, through every single movement of this amazing 30-minute routine.So that whether you’re an absolute beginner ... or an experienced 'yogi' ... you’ll learn to do it safely on your own. Soft chimes signaling every inhale and exhale of your *Core Breathing. In 30 minutes you’ll balance, stretch, and strengthen your whole body! How can I work my core muscles? You’ll do it all at once - treating your body like the ECOSYSTEM it is! And you’ll calm and focus your mind at the same time ... finishing clear, refreshed, and ready to perform at your highest level. You'll even save $$ (and time!) as your aches, pains and injuries disappear, allowing you to cut down on appointments with doctors, physiotherapists, and chiropractors. So why is it called Runner’s Yoga? Well, one of the things I noticed over my many years of teaching yoga is how frequently my running students are injured. According to the American Academy of Physical Medicine and Rehabilitation, almost 70% of runners will be injured. And in my experience, there are two main reasons. FIRST, it’s because of the incredible forces they’re subjected to. 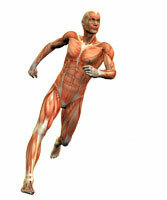 The body of a 130 lb runner, for example, has to absorb over 600,000 lbs of impact every mile! And it’s not just the lower body of the runner that’s affected. That jarring, tightening impact reverberates through the whole body, causing imbalances and tightness head-to-toe and leading a host of common injuries in runners. The SECOND reason is the intense “Type-A” approach that many runners are notorious for. This stressful, I’M-NOT-WORKING-HARD-ENOUGH approach tends to disconnect runners from the messages from their bodies - a leading cause of over-training and injury. In some cases this disconnect is so pronounced that runners will actually run themselves into fatal heart attacks! Which meant it was also easy for me with my background to recognize that yoga is the most powerful solution. For both problems - physical and mental. Not only does yoga give you a balanced, flexible body that performs better (see 'Range of Motion' below) and is much less prone to injury. But doing yoga has a profound effect on your MENTAL ATTITUDE as well. And any athlete (or therapist!) will tell you how important that is! The problem is, most of us don’t have enough time to get to classes regularly. I mean, add it up - How long does it actually take you to go do that workout or yoga class? Including travel, parking, changing, etc. 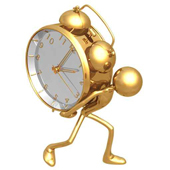 About the only people I know who can find that much time ... day after day, month after month, year after year ... are competitive athletes and the independently wealthy! And why not? One short routine that will help you stay fit and healthy, physically and mentally, for the rest of your life. A routine that is safe enough for beginners. Yet full of challenging options for the fittest athlete. And now, for the very first time, you can have the exact same program I teach in workshops (plus some great bonuses!) in a format that will allow you to get started minutes from now -even if you’re halfway around the world and it’s 2 o’clock in the morning! Years ago I came across a study that looked at people who lost fifty pounds or more. And most importantly, kept it off for more than five years. A pretty incredible feat, since most people who lose that amount soon gain back even more. Naturally, the researchers wanted to know what these people had done differently. And one of the things they found was that each of the successful participants had found an exercise routine they could do in about 30 minutes. All-inclusive. From start to finish. As a result, each one of them practiced their short exercise routine regularly - in some cases daily – year after year after year. No 'Yo-Yo dieting'. No Yo-Yo fitness! They got long-term benefits ... the healthiest approach. I realized this was a key aspect to what I was trying to create. And since I’d already designed a number of my own yoga programs, I took them out and started to experiment, this time with the 30-minute principle in mind. I wanted to see if I could combine the best aspects of each program into a single 30-minute routine. Every part of the body is stretched and strengthened. The poses are safe enough for almost anyone to do. The movements and postures flow together with a synergy that increases overall effectiveness. The muscles remain warm enough at all times for safe stretching. Until finally I had the routine I was after ... almost. I wanted to add one more thing. The Beat. The brain and body become alert, focused and calm. Heart rate and blood pressure are lowered in people who are anxious. It can dramatically accelerate learning and improve recall. It was clear to me that the whole Runner’s Yoga routine should flow to that special meditative rhythm of 60 BPM. So I recorded every breath, every movement, to that rhythmic beat, automatically putting your mind and body into a calm, focused state as you flow through the poses. Synchronizing the routine this way also allowed me to ensure that each Dynamic Stretch is held for at least 30 seconds. Why? Because studies show this is optimal for INCREASING YOUR RANGE OF MOTION. And any professional athlete will tell you how important that is! WHY WORRY ABOUT RANGE OF MOTION? had measurably less arm power than other members on the US swim team, BUT he had tremendous range of motion in his shoulders. Possible Injury - In some positions the last thing you should be doingis turning your head to look at a video. Limitation - You can only do the routine where you have a TV or video monitor. Impaired Focus – Watching the video sends your focus out of the body, not a good thing if you’re trying to improve your body awareness and stretch safely. Dependence - There is a tendency to become reliant on looking at the video images to know what the pose is. So despite some tempting offers, I passed on producing a video. Instead, I went to work writing VERBAL DIRECTIONS. Verbal directions that are so clear, calm and flowing that you can move through the routine just using the audio recording. And focus on what you’re feeling, rather than what you’re seeing. Variations for each movement and pose so that you can find the version that works best for your body ... your fitness ... your flexibility. M odern, easy-to-remember names for the poses, like 'Coffee Table', 'Hood Ornament', and 'Body Surfer'. Simple instructions for the remarkable CORE BREATHING technique that will have you breathing like a pro in minutes. Everything provided in digital format. So that you can download it and get started immediately! 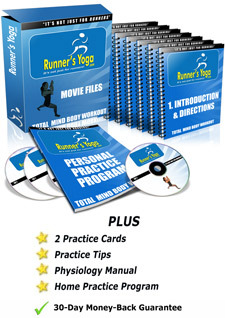 Just load the high-quality MP3 file into your player (or burn a CD from it) and you’ll be able to do your Runner’s Yoga almost anywhere!The special rhythmic beat sets the pace ... chimes cue the inhale and exhale of your Core Breathing ... and crystal-clear directions talk you through the whole 30-minute Runner's Yoga routine. Detailed options for each posture. A fascinating look at the science (both Eastern and Western) behind what you’re doing. Fast-forward preview of each section of moves you're about to learn. Detailed breakdown of all the options for different levels of fitness and flexibility. 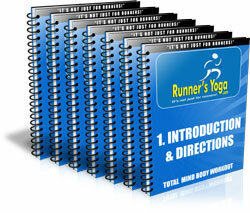 The complete Runner’s Yoga routine, pose-by-pose, in 8X11 pdf format. Great visual aids to help you learn and practice the routine. Print them up back-to-back and you have the whole routine on one sheet of paper you can take anywhere. Fold them in four, they fit in your pocket. Laminate them, they’ll last forever and you can even use them to practice outdoors. A valuable collection of practical tips from a variety of sources - yoga, martial arts, fitness training, etc. 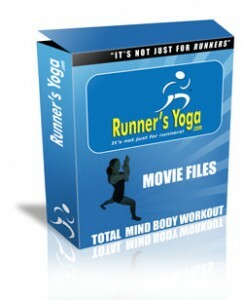 - that will help you take your Runner’s Yoga to the next level. A concise illustrated look at the bio-mechanics, physiology, and benefits of each individual pose in the Runner's Yoga routine. Which muscles are being stretched? Which body systems stimulated? What does yoga theory say? What is the view of western physiotherapy? When and where will be the best time and place for YOU to do your Runner’s Yoga. An incredibly effective tool that can help you make Runner’s Yoga a regular part of your life for years to come! 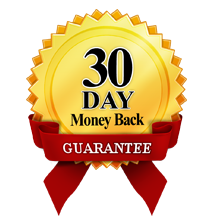 And to make sure you've got nothing to lose, I give a 30-Day Money Back Guarantee! Yup - you can try it for a month. And if it's not for you, just let us know and we'll give you back all your money. Check out the SCREENSHOTS and DETAILS, or the FAQ. And please, let me know if I can help in any way. Because I use every single part of the Runner's Yoga Program myself and I'd love to help you get started.